Actual Window Guard is simple solution for optimizing your workspace. Use it to always keep all windows on the desktop in the order you like. 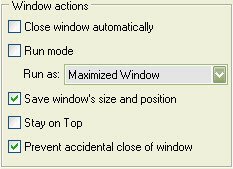 It can automatically set windows� position and size, minimize and maximize windows on startup, align them, close irrelevant pop-ups, keep windows on top and prevent them from accidental closing. The tool runs on all Windows platforms, works with x64 applications and manages command prompt windows as well.